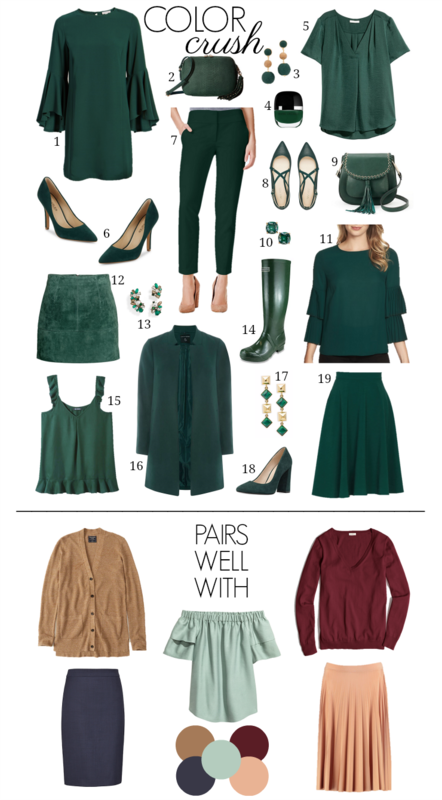 So many of you loved the first post in this new series (here) & after taking a poll on Facebook, the feedback was overwhelmingly in favor of green for the next installment. Though a few had requested olive, I chose to highlight this gorgeous emerald shade because I find it to be more wearable on a wide range of skin tones. Some of my favorite colors to pair with this pretty jewel tone are peach, marsala, camel, navy & seafoam. I’ve compiled a few top finds in this hue + several more options in the scrolling bar below. Please let me know what colors you’d like to see featured next! Love this series! This color is soo luxe. I’m loving your picks! Thank you for always showcasing affordable options! I LOVE this post! Thank you for considering different skin tones. As an AA woman, it is so nice to see! Love this color. I see several items I like. I love this color! This post made me want to add more of it to my closet. Love this series and that suede skirt?! GORGEOUS. I love this color, and I agree with the other commenters that this is a great new series. I’d love to see an installment with a blue – I’ve started seeing a lot of items in a kind of subdued medium blue lately (it ranges between an ocean shade and very greyed out). That would be my first pick for the next in the series. Wonderful suggestion – I will add it to the list!